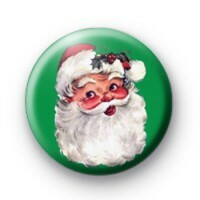 Father Christmas badge in green with a really traditional picture of Santa Claus in his red hat and bushy beard and wearing a sprig of holly on his hat. This is one of a selection of really traditional Christmas badges that we make and is inspired by more old-fashioned Christmas traditions. This Santa badge is great for older customers or those who prefer a more traditional Christmas, and they look great pinned to your lapel or hat during the Christmas period. The green colour of this badge is so festive and these badges are always popular. We have a large range of over 500 Christmas badges available & we make them all by hand in our family workshop. We get really busy in December so be sure to order as early as possible as they are all handmade to order. Be sure to check out the rest of our Xmas badge category for more father Christmas badges, Santa Claus badges, Christmas elf badges, Christmas reindeer badges and even our famous Christmas pudding badge. Ho Ho Ho, Merry Christmas & jingle bells!